In PRRI’s recently released American Values Atlas report, based on over 101,000 interviews conducted in 2016, we documented a six point drop in white evangelical identity (from 23% in 2006 according to Pew Research Center to 17% in 2016 in PRRI’s most recent report). While six percentage points in ten years is not an avalanche, it is significant both statistically and culturally. There are at least three major independent pieces of evidence corroborating recent PRRI findings about white evangelical Protestant decline. First, the Pew Values Survey, which uses an identical methodology to identify white evangelicals as PRRI, shows a distinct decline of white evangelical Protestants between 1997 and 2012. In 1997, the high point of white evangelical identity in the 1990s, 27% of Americans identified as white evangelical Protestant, and white evangelicals continued to be 22% of the population as recently as 2003. 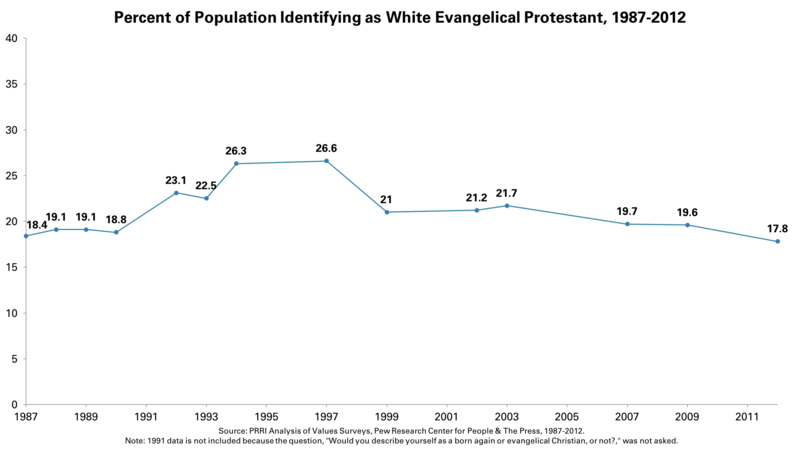 By 2012, the last year for which data was available in the Pew Values Survey dataset, white evangelical Protestants have dropped nine percentage points since 1997 to 18%. Second, internal data from the largest denominational representative of the white evangelical world, the Southern Baptist Convention, fits with the external demographic data. Over the last decade, the Southern Baptist Convention (SBC)—by far the largest evangelical denomination in the country and one that is overwhelmingly non-Hispanic and white—has lost more than 1 million members, according to LifeWay’s Annual Church Profile. The SBC has recorded negative growth rates in every year beginning in 2007. As Ed Stetzer of SBC’s LifeWay Research noted in a 2015 evaluation of the long-term trends, “Facts are our friends, and the fact is the SBC decline is not reversing, it’s accelerating.” The decade-long downward trend in membership growth among this flagship evangelical denomination is striking. Finally, the generational affiliation patterns are also consistent with the overall patterns of white evangelical declines. PRRI has consistently found that white evangelical Protestants are under-represented among young people. In our 2016 report, we found that only eight percent of young adults (age 18 to 29), compared to 26% of seniors (age 65 or older), identify as white evangelical Protestant. These generational differences are basically linear. The younger one is, the less likely one is to identify as white evangelical Protestant. Consistent with these results, white evangelical Protestants are also aging. In 1997, the high-water mark for white evangelical identity in the U.S. according to the Pew data, the median age for white evangelical Protestants was 48. Today, it is 55. These generational patterns support the current trend lines, and over time will almost certainly translate into continued white evangelical Protestant decline as a proportion of the population. Note: This post originally appeared on PRRI’s website. Daniel Cox, Director of Research for PRRI, specializes in survey research, youth politics, and religion. He regularly writes for major news outlets like FiveThirtyEight, Yahoo! News, and U.S. News & World Report. Robert P. Jones, CEO of PRRI, is the author of The End of White Christian America, and two other books, and numerous peer-review articles on religion and public policy. Dr. Jones writes a column for The Atlantic online on politics and culture and appears regularly in a “Faith by the Numbers” segment on Interfaith Voices, the nation’s leading religion news magazine on public radio. He is frequently featured in major national media such as CNN, NPR, The New York Times, The Washington Post, and others.